I’m already a member of one club created by love of a particular product that leads to spontaneous conversations with total strangers. I am, of course, speaking of the total strangers you will walk up to if you are both wearing a Nuu-Muu. You’ll have a conversation like the one I had a few months ago with a woman in the bulk bin aisle at Fred Meyer about whether or not you both own the same prints, whether or not you like pockets (the one point on which we parted company — yes of course you want pockets, how could you not? ), how great they are for travel, and their many other fabulous attributes. Today I discovered what I might have guessed would exist among the community of people who own e-bikes: that same opening to instantly strike up a conversation with a total stranger that’s created by your common love of something that makes your life better. We ended up talking for probably 15 minutes or more about why we chose the bikes we did, how much we carry, how great it is to have help going up a hill, and other things we’ve come to love about these bikes. In her case, she doesn’t have a car so her set-up — multiple cargo bags, a child seat, and a front tray that today let her carry home about a half dozen leftovers containers from a company event — is basically a minivan. We also compared strategies for getting heavy e-bikes into the building, since it’s a historic building that only has stairs at the front entrance, and a lift to the side with a call button and signage saying it’s only for use by people with disabilities. We agreed this is not a very accessible solution for people with disabilities, let alone everyone else who would benefit from an actual ADA ramp. I’ve watched people making deliveries unload heavy items, haul their rolling cart up the stairs, then reload it. Someone with a baby in a stroller might need to do something similar; thinking back to my baby-stroller days, this building entrance would represent a barrier. The “curb-cut effect” really does benefit everyone when you apply principles of universal design. I know at least one other e-bike owner in our building, a colleague of mine, who unloads everything from her bike and then hoists it up the stairs to reach the level the elevator is on. I’ve had kind strangers help me get up these stairs the past two days just because they happened to be there when I came in and started struggling. The hoisting approach doesn’t present an option for Anya, given her big family set-up — it’s just too much bike, too much to do/undo. I’d love to hear from people in historic buildings that have started to explore how you can maintain their character while also providing access to secure bike storage for heavier bikes, cargo bikes, and other things that would be served if you had an ADA ramp. We have a small bike rack on the other end of those stairs from the lift, but I wouldn’t leave Zelda parked there all day; it’s good for visitors who are only at the building for a short time. We wrapped up the Mutual Bike Admiration Society and Mini-Rant on Building Design and Close Calls on the Street. I gave Anya my card, told her I wanted to send her a link to the survey we’ll be doing as we update the state active transportation plan so she can send it to all her friends, and off we rode in our separate directions. Once again I faced a headwind; once again I felt glad of the extra help that Zelda gives me for my 9+ miles. And there was more e-bike community spirit to come. At the West Seattle Bridge a woman coming towards me with a red bakfiets e-bike smiled and waved, and we gave each other that head nod you give to members of the two-wheeled (or three-wheeled) clan if you’re a friendly type. As I climbed up over the West Seattle Bridge I heard the sound of an e-bike motor louder than Zelda’s (which is super quiet) coming up from behind me. A young man on a folding e-bike with fat tires rolled past me. We didn’t have a conversation but I still felt that sense of kinship. On a different topic — after all, I did originally name this blog Bike Style — I want to award myself double bike style points for today’s ensemble, possibly triple. First, I got to wear a really striking pair of shoes I don’t wear very often with a dress that they complement beautifully, discovering in the process that I need to add some nonslip grippy substance on the bottom to really hold my feet on the flat pedals. (Yes, I do award points for making discoveries about how everyday clothing can be made more bike-friendly, not just for getting it absolutely right the first time.) Second, the dress goes with Zelda’s paint color. Third, it was quite convenient that the dress is made of a quick-dry fabric since it started to rain about halfway home. I didn’t stop to snap on the rain skirt — just pedaled faster, took Zelda’s assistance up a notch, and got home to dinner and a hot bath as quickly as I could. Look at these shoes, then look at that dress. You’ll note the evidence of the rainy second half of the ride along the bottom. I paired this with a black wool jacket for riding, which was sufficient rain protection on my upper half, and wore a lighter black cardigan over it during the day. 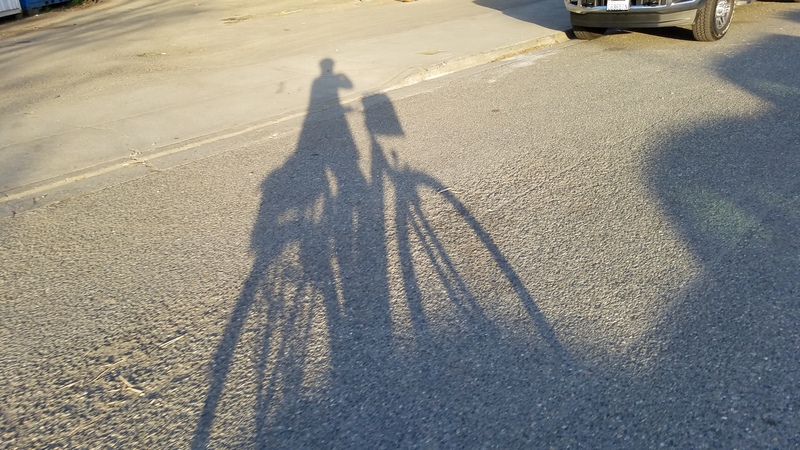 I had fun taking bike shadow pictures on my morning ride since the sun was shining.